I’m not a wine connoisseur. I used to serve the stuff when I worked as a waiter and I know the difference between red, white, rosé and sparkling, but that’s about as far as my expertise goes. Give me a single malt and I can probably tell you not only where it’s from and how old it is, but also which still it was made in and the name of the local village dog. Wine on the other hand is another matter. Whenever I’m involved in a discussion about wine, I always remember the BBC programme “Food and Drink”, specifically Jilly Goolden. Every week she’d be spouting all kinds of nonsense like an unsecured fire hydrant, spraying everyone nearby with fragrant descriptions of whatever the “plonk-de-jour” was. Talk of noses, depth, length, chocolate notes and vanilla on the cusp. Almost like you were visiting a plastic surgeon who side-lined as a chocolatier about a proboscis adjustment. Board games come in all shapes and sizes and in various types, usually involving hunting something, trading something or running away from something. 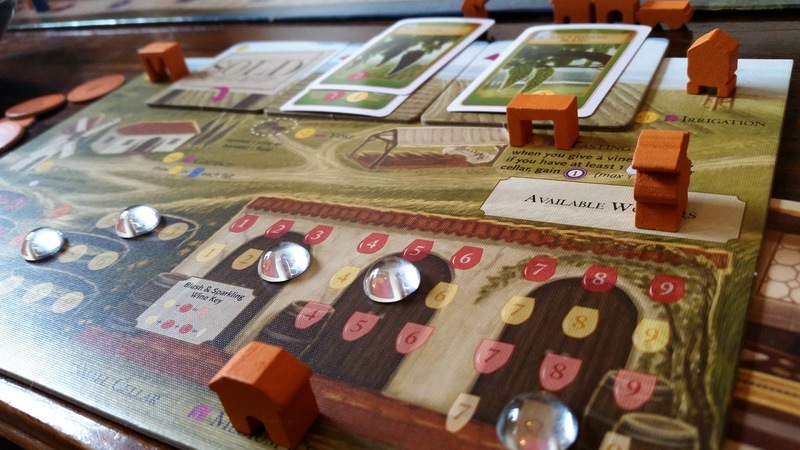 The subject of oenology isn’t one that immediately springs to mind when listing subjects for games, but Stonemaier beg to differ. 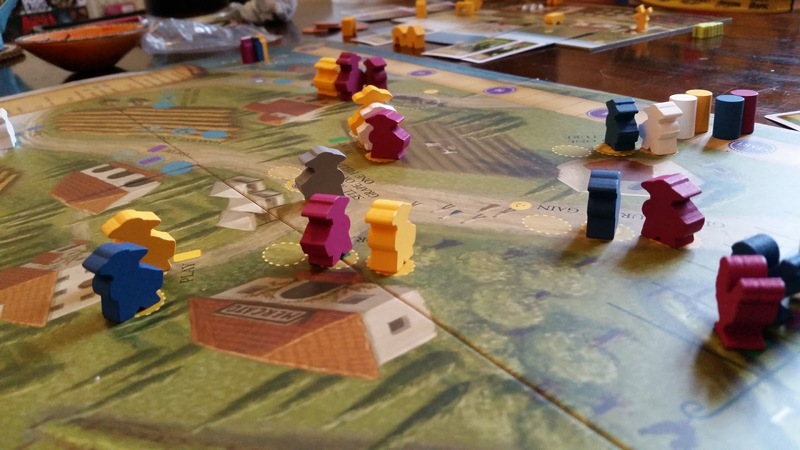 Viticulture is just that – a worker placement board game covering the many and varied aspects of vintnery and sommelliery. Following Viticulture’s release, it was expanded upon by Tuscany which added more to the game and a ton of additional aspects such as mafia connections, additional buildings and, quite thematically, cheese making. Tuscany also corrected a few issues with some of the cards (more on those later). 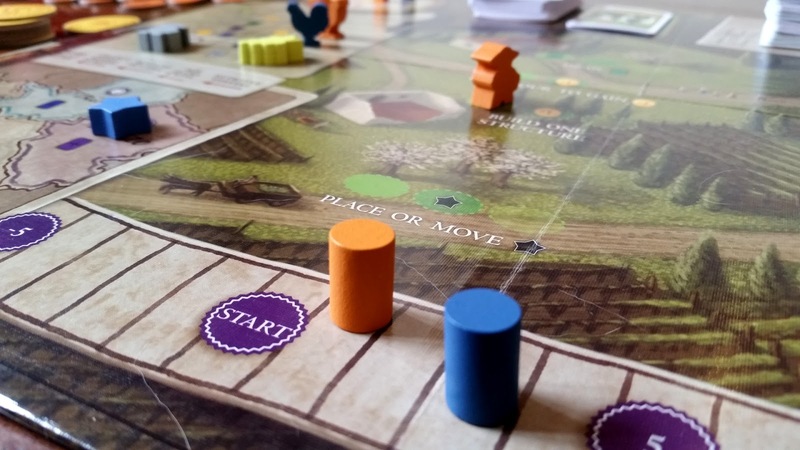 Then some bright spark came along and combined the two to create the Essential Edition – Viticulture with some of the smaller add-ons included, which is the version I’m looking at here. The game’s box art looks very subdued. It doesn’t jump out at you and scream “Play me!” The insides however tell a different story – it’s very colourful, bright and attractive. 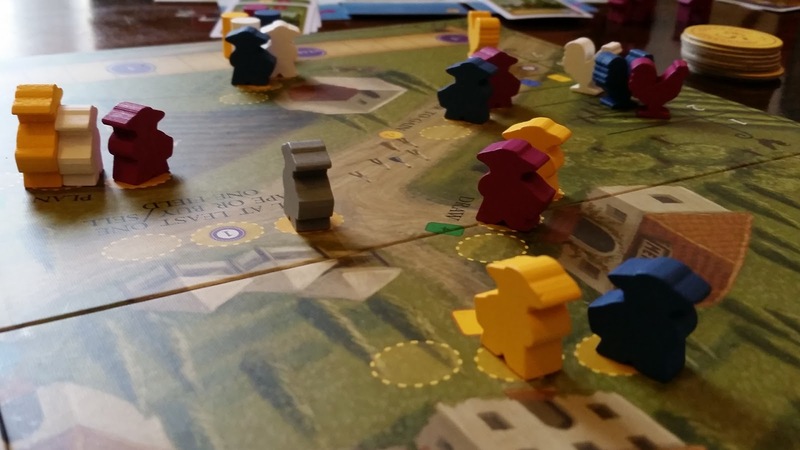 All six sets of meeples stand out from each other and the cards and (cardboard) coins do their job well. The board shows the vineyard together with all the possible actions throughout the calendar year. The actions have three slots each which unlock depending on the number of players – a fantastic mechanic to maintain a scalable game for varying numbers of players. It means that the action slots will always be in contention providing a driver behind strategy. Visitor cards are the big unknown in the game – they allow you to play special actions represented by visitors to your vineyard. They take the form of trainers, builders, workers, salesmen, marketers and so on. They each allow you to perform additional actions such as making more wine, selling it for money or victory points, gaining special wines, building things on the cheap and so on. Playing them takes an action, but they can mean the difference between earning much needed victory points in this turn or waiting until the next year when things will have changed drastically. If I’m honest, I think a couple of the cards are a little too powerful, but on the whole, they’re very balanced. With the addition of Tuscany’s deck and the Moor Visitors expansion, the decks are so large that the odd more powerful card isn’t noticed so much. Viticulture plays by year, consisting of the four seasons. In spring, each player chooses when their workers wake up – that is to say, who acts first. The action track contains different bonuses so there’s a toss-up between getting up and at’em or getting a slightly better bonus and a few more hours’ kip. Most of the time I’ve found that the additional meeple for acting last is very useful early on, but once things become more established, you’ll want to go for additional cards or victory points. Either that or I’m playing it wrong, which isn’t unlikely. Summer is a worker placement round and involves prepping your vineyard for the upcoming year – planting vines, building structures, playing Summer Visitor cards and giving tours to earn money. Autumn comes around to drawing a new visitor card each (or two if you have the right upgrade) then Winter involves more meeple placement to harvest grapes, press them into juice and bottle them into wine. The types of wine you can create vary on the grapes you harvest and the size of your cellar. It would appear that size does indeed matter as you’ll not be able to make blush or sparkling wines without the proper facilities. The ultimate goal is to fulfil Wine Orders – each order consists of a series of wine types and ages and a reward of Victory points and a residual payment, collected at the end of each year. Orders are fulfilled in Winter so you’ll probably find a fight starting to break out as to who gets to take up the limited spots on the board as the game progresses. To get round some of the competition for board slots there is the addition from Tuscany – the MegaMeeple. Each player gets one which can be put on any slot at any time, occupied or not. I found this to be a great idea – it means you have to think twice about denying someone access to a spot. Overall I find Viticulture to be an excellent, balanced and very well designed game, notwithstanding my personal affinity for Stonemaier games – although at this point if I fawned them any further, they may take out an injunction against me. Viticulture is currently one of my most played games which must mean something. It’s not long at about an hour or so and is very accessible for most levels of players. 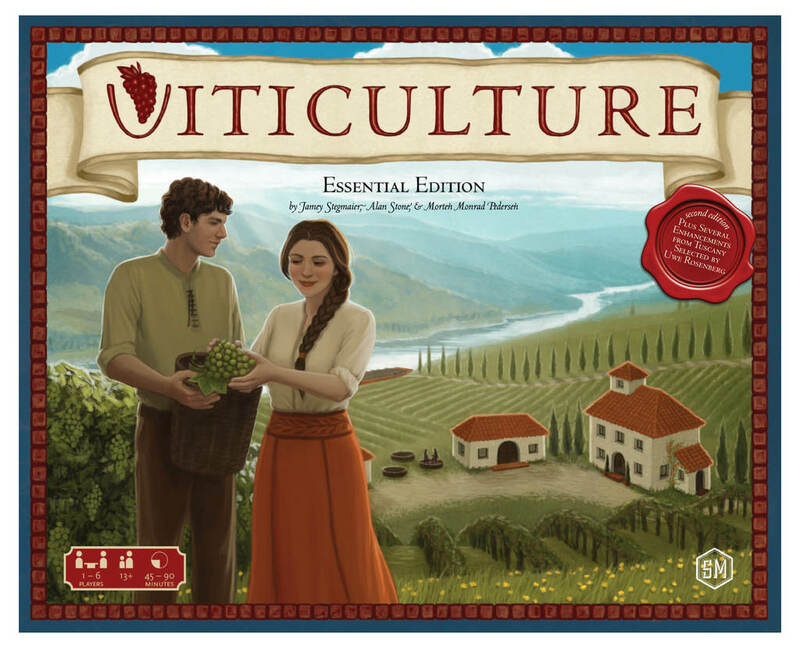 I strongly recommend playing Viticulture and its expansion, Tuscany, although sadly, finding the latter would be about as likely as being asked to star in the next season of Firefly. So sit down, grab a bottle of your favourite vino, pop a straw in the top and get your grape on.